These highlights do not include all the information needed to use REMODULIN safely and effectively. See full prescribing information for REMODULIN. Mild to moderate hepatic insufficiency: Decrease initial dose to 0.625 ng/kg/min. To report SUSPECTED ADVERSE REACTIONS, contact United Therapeutics Corp. at 1-866-458-6479 or contact FDA at 1-800-FDA-1088 or www.fda.gov/medwatch. Remodulin is indicated for the treatment of pulmonary arterial hypertension (PAH; WHO Group 1) to diminish symptoms associated with exercise. Studies establishing effectiveness included patients with NYHA Functional Class II-IV symptoms and etiologies of idiopathic or heritable PAH (58%), PAH associated with congenital systemic-to-pulmonary shunts (23%), or PAH associated with connective tissue diseases (19%) [see Clinical Studies (14.1)]. The infusion rate should be increased in increments of 1.25 ng/kg/min per week for the first four weeks of treatment and then 2.5 ng/kg/min per week for the remaining duration of infusion, depending on clinical response. Dosage adjustments may be undertaken more often if tolerated. Avoid abrupt cessation of infusion [see Warnings and Precautions (5.2)]. Restarting a Remodulin infusion within a few hours after an interruption can be done using the same dose rate. Interruptions for longer periods may require the dose of Remodulin to be re-titrated. In patients with mild or moderate hepatic insufficiency, decrease the initial dose of Remodulin to 0.625 ng/kg/min ideal body weight. 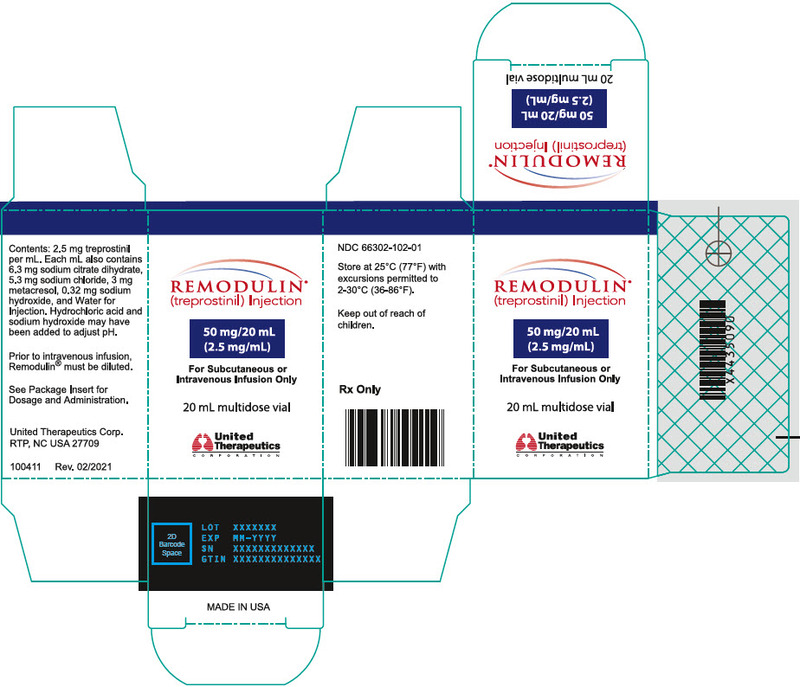 Remodulin has not been studied in patients with severe hepatic insufficiency [see Warnings and Precautions (5.3), Use in Specific Populations (8.6), and Clinical Pharmacology (12.3)]. Transition from epoprostenol to Remodulin is accomplished by initiating the infusion of Remodulin and increasing it, while simultaneously reducing the dose of intravenous epoprostenol. The transition to Remodulin should take place in a hospital with constant observation of response (e.g., walk distance and signs and symptoms of disease progression). Initiate Remodulin at a recommended dose of 10% of the current epoprostenol dose, and then escalate as the epoprostenol dose is decreased (see Table 2 for recommended dose titrations). In an open-label study of IV treprostinil (n=47) using an external infusion pump, there were seven catheter-related line infections during approximately 35 patient years, or about 1 BSI event per 5 years of use. A CDC survey of seven sites that used IV treprostinil for the treatment of PAH found approximately 1 BSI (defined as any positive blood culture) event per 3 years of use. Administration of IV Remodulin with a high pH glycine diluent has been associated with a lower incidence of BSIs when compared to neutral diluents (sterile water, 0.9% sodium chloride) when used along with catheter care guidelines. Titrate Remodulin slowly in patients with hepatic or renal insufficiency, because such patients will likely be exposed to greater systemic concentrations relative to patients with normal hepatic or renal function [see Dosage and Administration (2.5), Use in Specific Populations (8.6, 8.7), and Clinical Pharmacology (12.3)]. The following adverse reactions are discussed elsewhere in labeling: Infections associated with intravenous administration [see Warnings and Precautions (5.1)]. In controlled studies of Remodulin administered subcutaneously, there were no reports of infection related to the drug delivery system. There were 187 infusion system complications reported in 28% of patients (23% Remodulin, 33% placebo); 173 (93%) were pump related and 14 (7%) related to the infusion set. Eight of these patients (4 Remodulin, 4 Placebo) reported non-serious adverse events resulting from infusion system complications. Adverse events resulting from problems with the delivery systems were typically related to either symptoms of excess Remodulin (e.g., nausea) or return of PAH symptoms (e.g., dyspnea). These events were generally resolved by correcting the delivery system pump or infusion set problem such as replacing the syringe or battery, reprogramming the pump, or straightening a crimped infusion line. Adverse events resulting from problems with the delivery system did not lead to clinical instability or rapid deterioration. In addition to these adverse events due to the drug delivery system during subcutaneous administration, the following adverse events may be attributable to the IV mode of infusion including arm swelling, paresthesias, hematoma and pain [see Warnings and Precautions (5.1)]. Dose adjustment of treprostinil may be necessary when co-administered with CYP2C8 inducers or inhibitors. Human pharmacokinetic studies with an oral formulation of treprostinil (treprostinil diolamine) indicated that co-administration of the cytochrome P450 (CYP) 2C8 enzyme inhibitor gemfibrozil increases exposure (both Cmax and AUC) to treprostinil. Co-administration of the CYP2C8 enzyme inducer rifampin decreases exposure to treprostinil. It has not been determined if the changes in exposure of treprostinil with inhibitors or inducers of CYP2C8 observed for the oral administration of treprostinil would be similar for treprostinil administered via the parenteral route [see Clinical Pharmacology (12.3)]. Animal reproduction studies have been conducted with treprostinil via continuous subcutaneous administration and with treprostinil diolamine administered orally. In pregnant rats, continuous subcutaneous infusions of treprostinil during organogenesis and late gestational development, at doses as high as 900 ng treprostinil/kg/min (about 117 times the starting human subcutaneous infusion rate, on a ng/m2 basis and about 16 times the average rate achieved in clinical trials), resulted in no evidence of harm to the fetus. In pregnant rabbits, effects of continuous subcutaneous infusions of treprostinil during organogenesis were limited to an increased incidence of fetal skeletal variations (bilateral full rib or right rudimentary rib on lumbar 1) associated with maternal toxicity (reduction in body weight and food consumption) at a dose of 150 ng treprostinil/kg/min (about 41 times the starting human subcutaneous infusion rate, on a ng/m2 basis, and 5 times the average rate used in clinical trials). In rats, continuous subcutaneous infusion of treprostinil from implantation to the end of lactation, at doses of up to 450 ng treprostinil/kg/min, did not affect the growth and development of offspring. In studies with orally administered treprostinil diolamine, no adverse effect doses for fetal viability/growth, fetal development (teratogenicity), and postnatal development were determined in rats. In pregnant rats, no evidence of harm to the fetus was observed following oral administration of treprostinil diolamine at the highest dose tested (20 mg/kg/day), which represents about 123 and 48 times the human exposure, when based on Cmax and AUC of the average subcutaneous infusion rate achieved in clinical trials, respectively. In pregnant rabbits, external fetal and soft tissue malformations and fetal skeletal malformation occurred. The dose at which no adverse effects were seen (0.5 mg/kg/day) represents about 7 and 5 times the human exposure, when based on Cmax and AUC of the average subcutaneous infusion rate achieved in clinical trials, respectively. No treprostinil treatment-related effects on labor and delivery were seen in animal studies. Animal reproduction studies are not always predictive of human response. Safety and effectiveness in pediatric patients have not been established. Clinical studies of Remodulin did not include sufficient numbers of patients aged â‰¤16 years to determine whether they respond differently from older patients. 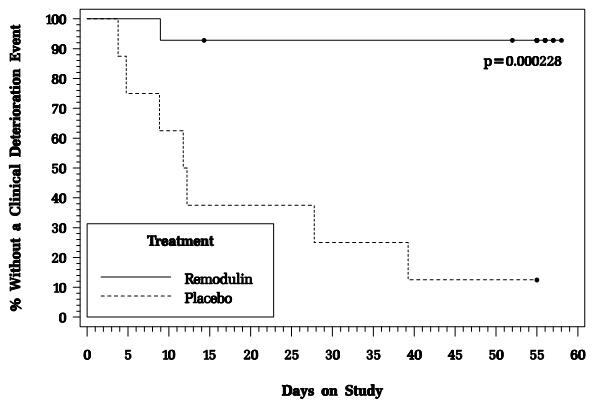 Remodulin clearance is reduced in patients with hepatic insufficiency. In patients with mild or moderate hepatic insufficiency, decrease the initial dose of Remodulin to 0.625 ng/kg/min ideal body weight, and monitor closely. Remodulin has not been studied in patients with severe hepatic insufficiency [see Dosage and Administration (2.5), Warnings and Precautions (5.3), and Clinical Pharmacology (12.3)]. No dose adjustments are required in patients with renal impairment. Treprostinil is not cleared by dialysis [see Clinical Pharmacology (12.3)]. 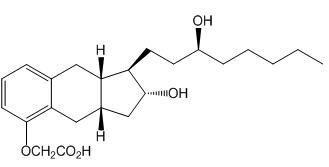 Treprostinil is (1R,2R,3aS,9aS)-[[2,3,3a,4,9,9a-hexahydro-2-hydroxy-1-[(3S)-3-hydroxyoctyl]-1H-benz[f]inden-5-yl]oxy]acetic acid. Treprostinil has a molecular weight of 390.52 and a molecular formula of C23H34O5. In patients with portopulmonary hypertension and mild (n=4) or moderate (n=5) hepatic insufficiency, Remodulin at a subcutaneous dose of 10 ng/kg/min for 150 minutes had a Cmax that was 2-fold and 4-fold, respectively, and an AUC 0-âˆž that was 3-fold and 5-fold, respectively, values observed in healthy subjects. Clearance in patients with hepatic insufficiency was reduced by up to 80% compared to healthy adults. In patients with severe renal impairment requiring dialysis (n=8), administration of a single 1 mg dose of orally administered treprostinil pre- and post-dialysis resulted in an AUC0-inf that was not significantly altered compared to healthy subjects. Drug interaction studies have been carried out with treprostinil (oral or subcutaneous) co-administered with acetaminophen (4 g/day), esomeprazole (40 mg/day), bosentan (250 mg/day), sildenafil (60 mg/day), warfarin (25 mg/day), and fluconazole (200 mg/day), respectively, in healthy volunteers. These studies did not show a clinically significant effect on the pharmacokinetics of treprostinil. Treprostinil does not affect the pharmacokinetics or pharmacodynamics of warfarin. The pharmacokinetics of R- and S- warfarin and the INR in healthy subjects given a single 25 mg dose of warfarin were unaffected by continuous subcutaneous infusion of treprostinil at an infusion rate of 10 ng/kg/min. A two-year rat carcinogenicity study was performed with treprostinil inhalation at target doses of 5.26, 10.6, and 34.1 mcg/kg/day. There was no evidence for carcinogenic potential associated with treprostinil inhalation in rats at systemic exposure levels up to about 34 and 1 times the human exposure, when based on Cmax and AUC of the average subcutaneous infusion rate achieved in clinical trials, respectively. In vitro and in vivo genetic toxicology studies did not demonstrate any mutagenic or clastogenic effects of treprostinil. Treprostinil sodium did not affect fertility or mating performance of male or female rats given continuous subcutaneous (sc) infusions at rates of up to 450 ng treprostinil/kg/min [about 59 times the recommended starting human sc infusion rate (1.25 ng/kg/min) and 8 times the average rate (9.3 ng/kg/min) achieved in clinical trials, on a ng/m2 basis]. In this study, males were dosed from 10 weeks prior to mating and through the 2-week mating period. Females were dosed from 2 weeks prior to mating until gestational day 6. Treprostinil diolamine did not demonstrate any carcinogenic effects in mouse or rat carcinogenicity studies. Oral administration of treprostinil diolamine to Tg.rasH2 mice at 0, 5, 10 and 20 mg/kg/day in males and 0, 3, 7.5 and 15 mg/kg/day in females daily for 26 weeks did not significantly increase the incidence of tumors. The exposures, when based on AUC, obtained at the highest dose levels used in males and females are about 7- and 15-fold, respectively, the human exposure of the average subcutaneous infusion rate achieved in clinical trials. Oral administration of treprostinil diolamine to Sprague Dawley rats at 0, 1, 3 and 10 mg/kg/day daily for 104 weeks did not significantly increase the incidence of tumors. The exposures obtained at the highest dose levels used in males and females are about 18- and 26-fold, respectively, the human exposure of the average subcutaneous infusion rate achieved in clinical trials. • Denotes statistically significant difference between Remodulin and placebo, p<0.05. 50 mL vial, carton of 1 (NDC 66302-150-50). Advise patients and caregivers to seek medical attention if they experience signs or symptoms of abrupt withdrawal of therapy or suspect a pump malfunction [see Warnings and Precautions (5.2)]. Inform patients and their caregivers to seek medical attention if they experience signs or symptoms of Remodulin overdose [see Overdosage (10)]. ©Copyright 2018 United Therapeutics Corp. All rights reserved. to adjust pH), and Water for Injection.